To many people, the idea of making a bodyweight exercise harder means adding more reps, taking less rest or performing the exercise quicker. 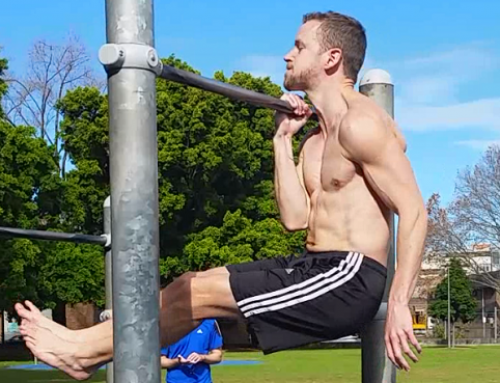 However in the world of progressive calisthenics, we use bodyweight to gain strength and build muscle. This means that we have to apply progressive overload and make the exercise more difficult. For weightlifting, this is easily done, just add a few more Kgs and you’re good to go. So how do we do this with bodyweight strength training? Here are 13 possible ways to progress a bodyweight exercise. Our legs are a lot stronger than our arms, so it makes sense if we shift more of our weight to the arms, it’s going to get more difficult. For example, to make a push-up harder, we may elevate the feet and perform decline push-ups. In a decline push-up more of the weight is through the arms as the feet are elevated. As this gets too easy we eventually progress towards handstand push-ups, where the legs are now taking none of the weight. We can utilise leverage to increase the difficulty of an exercise. Imagine you’re carrying a heavy log, you’d hold it in the centre of the log to make it easier to carry; holding it at the end would make it much more difficult. The same applies to your bodyweight. We can shorten the length of your body by bending the knees or even straddling the legs. For example, with hanging leg raises we can start by doing them with bent knees. As they get too easy, we start to straighten the knees, making the length of our legs longer thus increasing the difficulty. The obvious progression when you think of making a bodyweight exercise more difficult is to do it with one arm or leg. However, often we may need to shift more weight over to that limb first. For example with our push-up, we can do archer push-ups where we alternatively put more weight through one then the other. To increase the difficult further, we simply put more weight through the working arm by moving the other arm further away or elevating it. Full range of motion is more difficult than just performing a partial rep. This is why with pull-ups, we always encourage our students to pull as high as they can, rather than stopping once the chin passes the bar. By working off an unstable object, we can make exercises significantly harder; this means the smaller stabilising muscles will have to work a lot more. For example, try performing push-ups with both hands on a basket ball, once this is too easy, try a smaller ball. If you perform a standard push-up, it will work the chest, triceps and front delts (plus stabilising muscles). If we want to make this more difficult we can make adjustments to emphasise one of these muscles more. For example, close hand push-ups will emphasise the triceps more, pseudo planche push-ups will work the front delts more and wide grip push-ups will work the chest more. Performing any movement slowly will increase the difficulty as it requires more time under tension. You can also add pauses at difficult points of the movement, for example add a pause at the top of a pull-up or the middle position. On the other end of the spectrum, if you perform a movement as fast as you can and usually try to take yourself off the ground/bar, this will also add difficulty. Clapping push-ups, superman push-ups, squat jumps are all an example of an exercise performed explosively. With bodyweight leg exercises, the exercise can be made more difficult by moving the hand position so that it causes less counterbalance. For example a regular bodyweight squat is harder if we put our hands on our head or behind our back as the weight is now shifted more to the back and provides less counterbalance to our squat. Adjusting your grip of the bar or the ground can make a big difference to the difficulty of an exericse. For example you can do push-ups on your fingertips. Pull-ups have many grips we can use to adjust the difficulty. When most people get their first pull-up, they tend to kick their legs a little to help them up. As they get stronger they may find they no longer need to do this. This is an example of improving the form to make the exercise harder. Using momentum at the bottom of an exercise can make it a lot easier. If you work on reducing this you will require a lot more strength. A good example of this is the muscle-up; for most people when they first do a muscle-up they will have to kip. As you get stronger you can clean-up your muscle-up making it more difficult. Not always a necessary option but if you want then why not add some weight to a bodyweight exercise. At MP Calisthenics we use weighted dips and weighted pull-ups to test everyone’s max strength at the MPC Games.